For other uses, see Juneteenth (disambiguation). Juneteenth, also known as Juneteenth Independence Day or Freedom Day, is an American holiday that commemorates the June 19, 1865, announcement of the abolition of slavery in the U.S. state of Texas, and more generally the emancipation of enslaved African Americans throughout the former Confederate States of America. Its name is a portmanteau of "June" and "nineteenth", the date of its celebration. Juneteenth is recognized as a state holiday or special day of observance in forty-five states. Today it is observed primarily in local celebrations. Traditions include public readings of the Emancipation Proclamation, singing traditional songs such as "Swing Low, Sweet Chariot" and "Lift Every Voice and Sing", and reading of works by noted African-American writers such as Ralph Ellison and Maya Angelou. Celebrations may include rodeos, street fairs, cookouts, family reunions, park parties, historical reenactments, or Miss Juneteenth contests. The Mascogos, descendants of Black Seminoles, of Coahuila, Mexico also celebrate Juneteenth. During the American Civil War, President Abraham Lincoln issued the Emancipation Proclamation on September 22, 1862, with an effective date of January 1, 1863. It declared that all enslaved persons in the Confederate States of America in rebellion and not in Union hands were to be freed. This excluded the five states known later as border states, which were the four "slave states" not in rebellion – Kentucky, Maryland, Delaware, and Missouri – and those counties of Virginia soon to form the state of West Virginia, and also the three zones under Union occupation: the state of Tennessee, lower Louisiana, and Southeast Virginia. More isolated geographically, Texas was not a battleground, and thus the people held there as slaves were not affected by the Emancipation Proclamation unless they escaped. Planters and other slaveholders had migrated into Texas from eastern states to escape the fighting, and many brought enslaved people with them, increasing by the thousands the enslaved population in the state at the end of the Civil War. 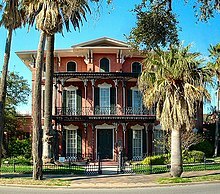 Although most enslaved people lived in rural areas, more than 1000 resided in both Galveston and Houston by 1860, with several hundred in other large towns. By 1865, there were an estimated 250,000 enslaved people in Texas. The older, and Hispanic, town of San Antonio had 168 among a population of 3,436. 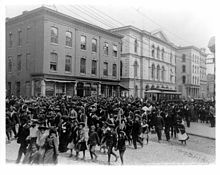 Formerly enslaved people in Galveston rejoiced in the streets after the announcement, although in the years afterward many struggled to work through the changes against resistance of whites. The following year, freedmen organized the first of what became the annual celebration of Juneteenth in Texas. In some cities African-Americans were barred from using public parks because of state-sponsored segregation of facilities. Across parts of Texas, freed people pooled their funds to purchase land to hold their celebrations, such as Houston's Emancipation Park, Mexia's Booker T. Washington Park, and Emancipation Park in Austin. In the early 20th century, economic and political forces led to a decline in Juneteenth celebrations. From 1890 to 1908, Texas and all former Confederate states passed new constitutions or amendments that effectively disenfranchised black people, excluding them from the political process. White-dominated state legislatures passed Jim Crow laws imposing second-class status. The Great Depression forced many black people off farms and into the cities to find work. In these urban environments, African Americans had difficulty taking the day off to celebrate. The Second Great Migration began during World War II, when many black people migrated to the West Coast where skilled jobs in the defense industry were opening up. From 1940 through 1970, in the second wave of the Great Migration, more than 5 million black people left Texas, Louisiana and other parts of the South for the North and West Coast. As historian Isabel Wilkerson writes, "The people from Texas took Juneteenth Day to Los Angeles, Oakland, Seattle, and other places they went." By the 1950s and 1960s, the Civil Rights Movement focused the attention of African-American youth on the struggle for racial equality and the future, but many linked these struggles to the historical struggles of their ancestors. Following the 1968 Poor People's Campaign to Washington, DC called by Rev. Ralph Abernathy, many attendees returned home and initiated Juneteenth celebrations in areas where the day was not previously celebrated. Since the 1980s and 1990s, the holiday has been more widely celebrated among African-American communities. In 1994 a group of community leaders gathered at Christian Unity Baptist Church in New Orleans, Louisiana to work for greater national celebration of Juneteenth. Expatriates have celebrated it in cities abroad, such as Paris. Some US military bases in other countries sponsor celebrations, in addition to those of private groups. Although the holiday is still mostly unknown outside African-American communities, it has gained mainstream awareness through depictions in entertainment media, such as episodes of TV series Atlanta (2016) and Black-ish (2017), the latter of which featured musical numbers about the holiday by Aloe Blacc, The Roots, and Fonzworth Bentley. In 1980, Texas was the first state to establish Juneteenth as a state holiday under legislation introduced by freshman Democratic state representative Al Edwards. Juneteenth is a "partial staffing" holiday in Texas; government offices do not close but agencies may operate with reduced staff, and employees may either celebrate this holiday or substitute it with one of four "optional holidays" recognized by Texas. By 2008, nearly half of US states observed the holiday as a ceremonial observance. As of 2014, 43 of the 50 U.S. states and the District of Columbia have recognized Juneteenth as either a state holiday or ceremonial holiday, a day of observance. States that do not recognize it are Hawaii, Montana, North Dakota and South Dakota. In 1996 the first legislation to recognize "Juneteenth Independence Day" was introduced in the U.S. House of Representatives, H.J. Res. 195, sponsored by Barbara-Rose Collins (D-MI). In 1997 Congress recognized the day through Senate Joint Resolution 11 and House Joint Resolution 56. In 2013 the U.S. Senate passed Senate Resolution 175, acknowledging Lula Briggs Galloway (late president of the National Association of Juneteenth Lineage) who "successfully worked to bring national recognition to Juneteenth Independence Day", and the continued leadership of the National Juneteenth Observance Foundation. In 2018 Apple added Juneteenth to its calendars in iOS under official US holidays. Organizations such as the National Juneteenth Observance Foundation are seeking a Congressional designation of Juneteenth as a national day of observance. ^ "Juneteenth Celebrated in Coachella". Black Voice News. June 22, 2011. Archived from the original on January 22, 2012. ^ "Juneteenth". Merriam Webster Dictionary. Retrieved May 30, 2013. ^ "National Observance of Juneteenth is Still a Struggle". Retrieved June 13, 2017. ^ Taylor, 2002. pp. 28–29. ^ "Mascogos. Siempre listos para partir". El Universal (in Spanish). September 19, 2016. Retrieved July 31, 2017. Sin embargo, la fiesta de la comunidad es el 19 de junio – el Juneteenth Day en Estados Unidos – el día que los esclavos de Galveston, Texas, supieron que eran libres. ^ a b c Cruz, Gilbert (June 18, 2008). "A Brief History of Juneteenth". Time magazine. Retrieved May 30, 2013. ^ a b c d e Gates, Henry Louis, Jr. "What Is Juneteenth?". The African Americans: Many Rivers to Cross. PBS. Originally posted on The Root. Retrieved September 30, 2014. ^ a b Barr (1996), p. 24. ^ a b c "Juneteenth". Texas State Library and Archives Commission. Retrieved July 6, 2006. ^ Campbell, Randolph (1984). "The End of Slavery in Texas: A Research Note". Southwestern Historical Quarterly. 88 (1): 71–80. ^ Adams, Luther (November 29, 2010). Way Up North in Louisville: African American Migration in the Urban South, 1930–1970. University of North Carolina Press. ISBN 978-0807899434. ^ Wilkerson, Isabel (2010). The Warmth of Other Suns: The Epic Story of America's Great Migration. New York: Random House. Retrieved June 19, 2015. ^ Chandler, D.L. (June 19, 2012). "Juneteenth: Celebrating The Early Moments Of Freedom Today". News One. Retrieved June 19, 2014. ^ a b Moskin, Julie (June 18, 2004). "An Obscure Texas Celebration Makes Its Way Across the U.S." The New York Times. Retrieved April 28, 2011. ^ "The World Celebrates Freedom". Juneteenth.com. Retrieved June 19, 2006. ^ Ho, Rodney (October 25, 2016). "FX's 'Atlanta' recap ('Juneteenth'): season 1, episode 9". Atlanta Journal-Constitution. Retrieved June 18, 2018. ^ Framke, Caroline (October 4, 2017). "Black-ish's musical episode about Juneteenth is a pointed lesson on American ignorance". Vox. Retrieved June 18, 2018. ^ "I Am A Slave". YouTube. ABC News. Retrieved June 18, 2018. ^ "We Built This". YouTube. ABC Television Network. Retrieved June 18, 2018. ^ Butler, Berhonie (October 4, 2017). "'Blackish' gives a powerful history lesson – with nods to 'Hamilton' and 'Schoolhouse Rock'". Washington Post. Retrieved June 18, 2018. ^ Dingus, Anne (June 2001). "Once a Texas-only holiday marking the end of slavery, Juneteenth is now celebrated nationwide with high spirits and hot barbecue". Texas Monthly. Retrieved October 11, 2013. ^ "Maryland". Retrieved July 19, 2016. ^ Brown, Stacy M. (May 30, 2014). "Juneteenth officially recognized in Maryland". Baltimore Times. Retrieved October 1, 2014. ^ "New Hampshire governor recognizes Juneteenth day". The Seattle Times. June 19, 2018. Retrieved June 19, 2018. ^ "S.Res.175 – A resolution observing Juneteenth Independence Day, June 19, 1865, the day on which slavery finally came to an end in the United States". United States Congress. June 19, 2013. Retrieved June 19, 2015. ^ Ciaccia, Chris (February 16, 2018). "Apple's iCal calendar mysteriously deletes Easter". Fox News. Barr, Alwyn (1996). Black Texans: A History of African Americans in Texas, 1528–1995. University of Oklahoma Press. ISBN 978-0806128788. Taylor, Charles A. (2002). Juneteenth: A Celebration of Freedom. Open Hand Pub Llc. ISBN 978-0940880689. This page was last edited on 5 April 2019, at 15:23 (UTC).